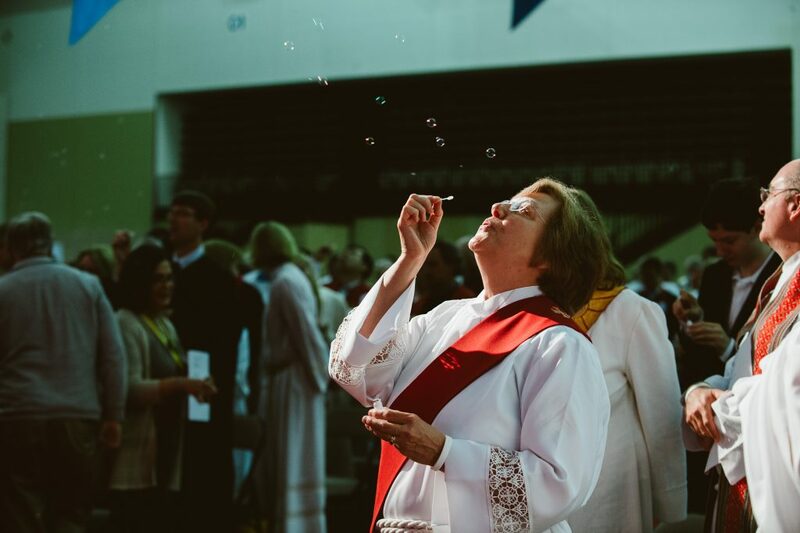 (Wildwood, NJ) – It wasn’t hard to imagine a packed auditorium of high-spirited church leaders, but no one imagined they would be blowing bubbles at the 2016 Annual Conference. From May 22-24, over 1,400 people converged on the Wildwoods to reconnect, celebrate, and adventurously envision new things for the church’s future. The conference theme of “Imagine” was comprised by the colorful imagery of spherical lanterns throughout the Wildwoods Convention Center and the use of bubbles to close out the opening worship, which, due to a schedule shift, was combined with the Commissioning and Ordination Service Sunday evening. Based on the Bible verse of Ephesians 1:18, where Paul, writing to the Church in Ephesus, asks God to give discernment and a clear vision to see the hope of his call, the theme was present throughout the conference. “Imagine the possibilities ahead of us!” Bishop John Schol exclaimed, asking God to grant grace and wisdom to stir up imagination. He called the conference to imagine a church with tremendous vision and diversity which will grow vital congregations to transform the world. “What we know needs to be abandoned sometimes,” Bishop Schol said. “Sometimes the church is too familiar with what it is rather than what God is calling it to be.” The sermon went on to describe vacating the comforts of security to embrace trust instead. Twenty-three candidates participated in the ordination and commissioning service. The Bishop called the candidates to be imaginative people who dare to live into God’s dream for the world. Charles Seele from Manchester, whose son-in-law Blair Goold was commissioned, said the sermon challenged him. “We all need to be moved out of our comfort zones,” he said. Seele’s grandson and Goold’s son, Matt Goold of Haddon Heights, was moved by the “thoughtful and mindfulness” of the message. “As a millennial, I really appreciate that,” he said. San Orekoya , from Jersey City UMC, loved the use of the bubbles at the end. “That was very exciting,” he said, “I’ve never seen anything like that.” The sermon also inspired Orekoya’s wife, Ola. “We shouldn’t let security get in the way of imagining things,” she said. More than $63,000 was collected for the mission fund during the service, helping to eliminate death from malaria and rebuild homes for people with damage from Superstorm Sandy. The theme of imagination wove itself throughout the conferences various speakers and services. Robin DiAngelo, a former Associate Professor of Education and two-time winner of the Student’s Choice Award for Educator of the Year, addressed the church with a compelling and thought-provoking presentation imagining the world without racism. She challenged United Methodists to develop the skills and mindset necessary to create a just society, asking the body to submit their hopes and suggestions for the church to the Greater New Jersey task force developing a ten-year plan on cultural competency. “Time doesn’t heal all wounds,” Samuel said, “It’s what we do with the time.” She went on to say how clinging to God makes us grow in our faith. The worship band, led by Director of Worship Eric Drew, was a creative and imaginative collaboration that brought together musicians and singers from Haddonfield, Camden, Pleasantville, Ridgewood, Bridgewater, Newark, and Ventnor. The group showcased the diversity and talent of Greater New Jersey. Lay Leader Rosa Williams and four young leaders: Lakesha Groover from Mosaic Ministries, Andrew Ryoo from Greenhouse Church, Charles Perez from Dover UMC, and Joy Foley from A Future With Hope, shared personal testimonies of church plants, innovative ministries, and mission. James Lee, Manager of Visual Arts, imagined stepping outside the norm to film a humorous and informational video on making a new disciple. The video showed Connectional Ministries team explaining how each of the five markers of vitality contribute to making a disciple and deepening faith. The light-hearted film was among many powerful videos shared during conference, and was met with laughs and applause. More than 875 people attended six workshops at the conference, 150 of which worked in unison to systematically pack 30,000 meals to support the efforts of Stop Hunger Now, a non-profit with a bold mission that imagines the end of world hunger in the 21st century. Founded in 1998 by United Methodist minister Ray Buchanan, the organization set up tables inside the convention center where the streamlined meal packaging took place.